In one of my regular recent blog reads, The HR Capitalist Kris Dunn, recently wrote about how Warren Buffet’s most trusted business partner, Charlie Munger, attributes his success managing Berkshire Hatheway’s stock market portfolio by “knowing a little about everything.” Basically, being a generalist. Here is the article about Munger from The Hustle. Dunn, being an HR Blogger, of course related Munger’s successful philosophy to the HR Generalist function compared to the HR Specialist. HR Generalist – a HR pro at any level who is in charge of a client group of employees -meaning they provide HR services to a location, a business unit, a functional area or geographical area. As part of this role, they provide counsel, service and insight across the HR Body of Knowledge – comp, benefits, recruiting, employee relations, legal, etc. An HR Generalist can exist at the individual contributor level or manage people, as well as exist at the HR Rep, HR Manager, Director, VP and CHRO level. As Dunn noted in his post, many attribute HR Generalists as more of an entry level HR position. It’s not. As he defines it, it exists at the individual contributor, Manager, Director, VP, and CHRO levels. Back to Munger, his work-ethic theory is known as expert-generalism which is the opposite of the Gladwell’s famous 10,000 hour rule. What Munger does is to focus “on studying widely and deeply in many fields, including microeconomics, psychology, law, mathematics, biology, and engineering, and applied insights from them to investing.” rather than just focusing all of his time on investment theory. Draw on that palette of diverse knowledge to recognize patterns and connect the dots across multiple areas. Drill deep to focus and perfect the thinking. Hmm, sounds like the world could use a few more EG’s. I enjoyed both Dunn’s and The Hustle’s articles because I’ve had the most success in my career as a Generalist. First as an award-winning General Manager for Macy’s (The Bon Marche’) and as an HR Director and HR Consultant. As a matter of fact, at Macy’s (The Bon Marche’), I regularly told my Department Managers that I expect them to be the experts/specialists in their area of responsibility because I joked told them that there was no way that I could know as much as they did – I was the General Manager. I literally said the same thing as Munger, “I have to know a little bit about everything” in the store. This meant knowing a little (but enough) about each department’s assortment, staffing, employee capabilities, and merchandising; customer service performance; current and upcoming sales events; sales and profit performance; local and national economy; store operations; capital improvements; customer, community, regional & corporate relationships; etc. The philosophy worked (*self promotion alert! *) because my store earned the Store of the Year award twice during my 13 year stint as a General Manager. Dang! I just remembered how hard (but rewarding) it was to be a General Manager! I’ve also always proudly worn the moniker “HR Generalist” when I transitioned from running a Department Store to doing HR. But I often felt a little uncertainty reading articles and blogs touting how the future of HR is specialization. After researching and writing this post, I now officially call myself an HR Expert-Generalist. I like it. If you’re an HR generalist at any level, be proud. You’re a trusted adviser that understands that the world is gray, and you also know how important you are in helping those in your client group navigate all the complexity and chaos that comes with managing a workforce. Simply put, HR Generalists are the most important cog in the HR world. Be proud, because you are irreplaceable. As always, it’s nice having a little confirmation bias every once and a while! Oh, and just I added “HR Expert-Generalist” to my LinkedIn profile headline. 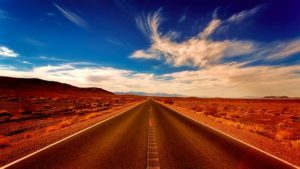 I was at a tech industry HR event in Boulder a few months ago and we were all asked to talk about our “HR Journey” – what was it that led us to choose HR as a career. Or what was it that led HR to choose us? The exercise required that we had to get up in front of everybody and tell our story. We didn’t have much, if any, time to prepare as we didn’t even know we were going to do this exercise. The first “drafts” of our stories were a little rough but then we were allowed to get up again and tell our stories again, and this time they were more polished. I enjoyed the exercise because it forced me to really think quickly of a story that led me to choose HR as a career. My mind was blank but it came to me as I was walking up to the front of the room to tell my story. Funny how the mind works. I started my career right out of college working for a Pacific Northwest based retail department store called The Bon Marche’ (which is now part of Macy’s). I worked my way up the ladder until I reached my desired goal of being a Store Manager. I loved being a Store Manager and in my 13 years as one, I earned the Store/Store Manager of the Year award twice along with a record number of performance awards during my tenure. I learned that I loved building consistent high-performing cultures filled with employees who loved doing what they did in a tough, low-paying work environment. In retail, HR is a very important and vital element. It was what I enjoyed the most and I was very good at it and thought I’d do it for the rest of my career. But there was a particular incident that occurred that led me to seriously consider leaving and focusing on HR as my next career direction. It was Sept or Oct and a young pregnant woman came in for an interview for the Holiday season. As a Store Manager I always enjoyed participating in the interviewing and hiring process. She interviewed well, I saw that she had potential, and I decided to hire her. I didn’t care that she was pregnant. I only cared that she was smart, enthusiastic, and cared for customers. She would be a great addition to the store team. Years later, she reached out to me via Facebook and told me how much she appreciated me hiring her that day. I had changed the direction of her life. Nobody else in town would hire her because she was pregnant. To make matters worse, she was single and pregnant and her life was a mess. I had no idea at the time but my believing in her and hiring her gave her new hope. My team at the store was just that, a team that cared about each other and helped each other. The team took her in and she became part of the store family. She was surrounded by people who cared and she responded by giving us everything she had and became fantastic sales associate. I’m very proud of the teams I build and how they always cared for and loved each other. That is what I enjoyed most about my job. Building strong high performing cultures of people that loved (or at least liked) their work. That is why I went into HR so I can help leadership build strong, high-performing teams. Today, this woman owns her own retail business, has her life together, and is doing very well. She is also is the proud mom of a beautiful daughter. Bottom line, the main reason I moved into HR was to use my talent and skills to help organizations create positive, high-performing cultures where people really enjoy coming to work. We spend huge amounts of our time at work and I believe our workplaces should be happy and supportive places where we enjoy being every day. The ability to create and provide a high-performing culture where people want to be, directly helps accomplish the importance of business goals in any organization. The overall company performance improves, productivity increases, and financial performance improves – all of which produces greater shareholder value. I want to be able to be a positive influence on employees and, by extension, their families by creating a positive work culture where the employee is happy and feels like they are accomplishing meaningful work. Frankly, it’s the right thing to do. And I’m glad I’m able to do it. The most important thing an HR professional who’s moving into a new job or department can do is to build and establish a rock-solid foundation of credibility, competence, and trustworthiness. Today, I’m going to discuss how to do this. There are two things an HR pro typically does when starting a new job at an organization or transferring to a new department. They come in with “guns a blazing” and immediately start changing the way everything is done and immediately start introducing HR initiatives. They focus on quickly making a big splash introducing HR initiatives and impressing senior leadership. They come in and take the time to get and know the employee’s, their team, processes, and culture. They focus on providing outstanding customer service to their client base and getting a good lay of the land and culture before making significant changes and introducing big HR initiatives. Yes of course, sometimes you have to come in with “guns a blazing” and get things fixed quickly. The situation, and leadership, demands it because they need things to be fixed, and fixed yesterday. While it seems to make sense at first, it’s not. It will mostly cause significant chaos and business disruption. It certainly does not establish the credibility, competence, and trustworthiness for the new HR pro! The best and most effective way for the HR pro to establish their credibility, competence, and trustworthiness in the eyes of their new company/department is to take the time to get to know and understand the team, processes, and culture before making any drastic changes. Build that important and critical foundation. Remember, Human Resource pro, you are dealing with humans and, as such, you need to build a foundation of relationships first before you will be able to accomplish anything with any credibility and trust. Everybody in your organization is watching what you are doing and how you are doing it. Start building a solid foundation so that you will be seen as a credible HR expert. Make sure there are minimal mistakes made with the basics like payroll, benefits, answers about polices, etc. Here are the steps I recommend to build a strong and stable foundation that will establish your credibility and ability to effectively manage the HR function in your new organization. I think we all know this but often forget as it is the blocking and takleing. Most importantly – get to know the team. Get out of your office every single day and CIRCULATE around the office(s), store, plant, etc. and chat with your fellow employees. Learn your employee’s names and what’s important to them both personally and professionally. This helps them see HR as a part of their team, not the Grim Reaper that only makes an appearance when something bad is about to happen. Study and know the employee handbook (I know, zzzzzzzzzzzzzzzz) and other policies and procedures. You’ll need to be able to answer policy and procedure questions from employees as you circulate and as they come by your office/desk. Dig into the HRIS and make sure all the data in there is complete and accurate. It often isn’t. Make sure it is so that everything that feeds from the HRIS (payroll, benefit integration, etc) will also be accurate. Become the expert in the health and retirement benefits your organization offers. Make sure enrollments are completed with 100% accuracy. Build great relationships with your brokers and ask lots of questions. Respond quickly, accurately, and politely to all manager and employee requests and questions. Remember, you are a service organization supporting the other functional areas of the organization. Don’t ever be condescending because you think they should know the answer. 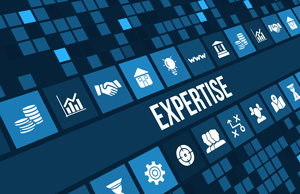 You are the HR expert, not them and they are coming to you for your expertise – the reason you have the job! By doing these five basic steps, you build the foundation of a successful HR function in your new organization. These are the basics that will establish you as a credible and trustworthy HR professional in your employee’s eyes. Yes, I know every senior HR professional, and leadership team, wants to do the exciting strategic stuff but without that important foundation, the strategic HR initiatives will fall flat because you will not have the credibility and trust from the very people who need to buy in to those initiatives. You absolutely must have a solid and effective foundation in order to effectively build the strategic framework that your leadership, managers, and employees will embrace. This will ensure your success in your organization and allow you to more easily have your strategic HR initiatives be successfully adopted. Amazon announced this past week that it will be adding 100,000 new full-time jobs in the US in the next 18 months. Having spent the early part of my career in the retail industry as a store manager for Macy’s, I like to still keep up with the news and goings-on in the retail industry. What’s so interesting about the news from Amazon is the news from the big traditional retailers that is happening at the same time. Macy’s closed 40 stores in 2016 and announced it will close 100 more in 2017, recently listing 68 of those stores getting the ax. In addition, Sears Holdings announced that it is closing 150 Sears and KMart stores, and JC Penney recently announced it will be closing a bunch of its stores. I’m only touching on the major retailers here and there are dozens of the small retailers closing stores as well that are too numerous to list. Obviously, Amazon and technology have fundamentally changed the entire retail landscape. The big traditional retailers didn’t see it coming and didn’t, or couldn’t, keep up. They seem to be heading in the direction of some smaller retailers, Blockbuster and Borders who are a shell of what they once were or no longer even exist. I remember being asked by one of my employees back in the early 2000’s when I was a store manager for Macy’s what I thought about online retail putting traditional retail out of business. My employee was very concerned and I told her that I doubt companies like Amazon would ever be much of a threat to the big retail giants like Macy’s, Sears, JCP, etc. After all, people like to go out and shop, handle merchandise, try things on, and talk to and interact with other people. I thought online retail would certainly have it’s niche (books, music, etc.) 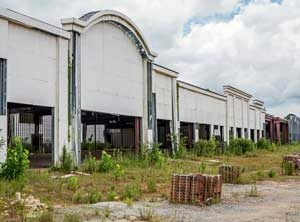 but didn’t think it would ever pose a serious threat to traditional retail. The news that Amazon is planning to hire 100,000 people at the same time the big traditional retailers are announcing huge store closings and layoffs tells you everything you need to know. Amazon has successfully changed the way people like to shop and I include myself in that change. Frankly, I love shopping on Amazon and because I’m a Prime member, I get “free” shipping for most of what I buy from them. Yes I know it’s a gimmick but it does make me feel special! I find it a pain to go to the mall and much easier to find what I want online where the selection is unlimited I click a few times and then get a package delivered to me in a couple days! I find it very satisfying. There are some who are criticizing Amazon complaining that the jobs they are creating are low paying jobs. This is true, however, most retail jobs in general, have always been low paying jobs anyway so it looks to me that they are basically just replacing many of the jobs that the big traditional retailers are cutting. There are also a lot of good paying jobs at Amazon, just as there are/were at the traditional retailers. There is the buying organization, management, HR, recruiting, IT, and other support services. Amazon has said that its employment figures alone do not capture its full effect on jobs. On Thursday, the company said its marketplace business, through which independent merchants sell goods on the company’s site, sustained 300,000 additional jobs in the United States. And sure, Amazon has had some growing pains and had some bad press about their workplace culture but in talking with some of my friends who work there, they are making efforts to improve. Jeff Bezos and his team have done an amazing job building their company from an online bookseller to a full line store and fundamentally changing our shopping behaviors. They’ve been aggressive and innovative and it’s been fascinating to watch. Amazon is leading another round of creative destruction in the retail industry where one form of the retail industry is being replaced by a new and much more innovative one. Shopping malls with big anchor stores are being replaced by online retail just like downtown shopping districts were replaced by shopping malls back in the 1950’s -1990’s. And I’m sure we will see something replace online retail in the future. Creative destruction is tough. It’s tough on many people. But creative destruction is also good and necessary for advancement and growth. If we didn’t have it, we wouldn’t have all the things that make our lives so much more enjoyable. All you have to do is look back 50 years, 100 years, 200 years and see how far we’ve come and it was all because we allowed creative destruction run its natural course. Don’t forget to take the survey on today’s subject about Amazon and the creative destruction occurring in the retail industry. Well crew, I was downsized this summer. Ironically, my last post before this one was about the trouble in the energy industry and how employers in the industry are downsizing. The company I worked for is a uranium mining company and they are having a very difficult time in the current economic climate of the energy and uranium mining industries. Sometime around May and June, things started getting, shall I say, very uncomfortable at work. My gut was telling me something unpleasant was about to happen soon. Ultimately, my fears and intuition were accurate and I was sent packing along with approximately 20% of the company. They eliminated almost all of the administrative staff and several folks out at the mine. It was a rough day. From what I understand, they are now down to a bare bones team to support and operate the mine. It was, in retrospect, something that needed to happen as the company has been struggling for several years hanging on and hoping the market would improve. We had even done earlier Reductions in Force. Instead, the market continued to decline as the uranium spot price fell. It’s a great company with a lot of great people and I wish them the best and I really hope the market will improve soon! Enough about my former company and on to the next phase of my life. So now I’m without a job and looking for work. I’ve never been unemployed in my 32 year career. I knew exactly what I needed to do to find a job but I had never had to actually do it. After taking a few days to lick my wounds, I brought up my resume, which I’ve been keeping updated every quarter, and wrote a cover letter. When I had these ready, I started my search by contacting several recruiters with whom I’ve worked with in the past. I searched on Linkedin, Indeed, CareerBuilder, and others as well as checking out the career pages of some organizations that interested me. I also contacted my network, who I’ve kept in touch with for years, and let them know my situation and asked them for help. I was excited to get an interview right away with a tech company in the Denver area. They were looking for somebody with start-up HR experience. I built the HR function from the ground up at my former company so I was a prime candidate. I was thinking how great this would be to land a job within a month! No such luck. I went through the entire interview process and ended up a finalist along with one other candidate but lost out. Dang. Back to the drawing board. 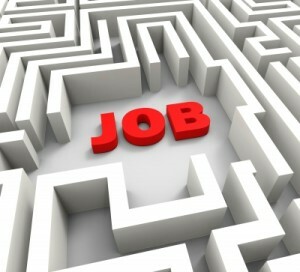 My strategy is to apply to all the Senior HR jobs ranging from SR. HRBP to VP of HR. I’m applying for everything to which I’m qualified in organizations where I think I will be a great fit. I’m very interested in software and tech companies. 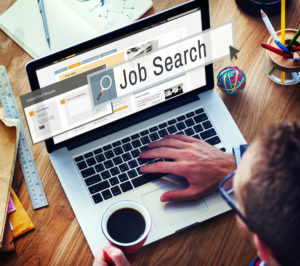 My thinking is that the more jobs to which I apply will make my resume and cover letter better as I refine and tailor each to the particular job description highlighting my experience and skills appropriate to that job. I’m also taking every interview in order to improve and refine my phone and face-to-face interviewing skills. My initial resume and cover letter were modeled after a sample from a podcast that I think very highly of. Unfortunately, after getting only that one interview request out of the first 30 applications (a measly 3% return rate), I decided I needed to completely overhaul and re-tool both documents. I did some online research and found some samples that caught my eye (key point) and modeled my new resume and cover letter from them. It was like night and day. From the 57 applications I sent out with my newly re-tooled resume and cover letter, I got 11 interviews (an excellent 19.3% return rate)! I kept refining this new version and finally hit on a winner as most of those 11 interview requests came through more recently and six of them are still active. My philosophy is to simply jump in and start doing before everything is perfect. Before my resume and cover letter are perfect, before the perfect company has a job available, or before the perfect job pops up. If I waited for perfect, I would probably still be waiting. Instead, I learned from my mistakes, made improvements, and I now have six active interviews as of this posting. I also learned that I’m a strong face-to-face interviewee but was a weak phone interviewee. Unfortunately, the phone interview is the screen for the face-to-face. I did poorly in the first few phone calls and was quickly rejected. So I changed and improved my phone interview technique after doing some research and tried out some new things. This resulted in several face-to-face interview opportunities. Jumping in before anything was perfect and refining and trying new things until I got positive results are the best advice I can give you. Don’t be afraid to put out something far from perfect (heck, look at this blog and podcast!). I can tell you the more you do it and work on improving as you receive feedback, the better the end result will be. It’s a tough slog trying to find a senior level HR job. There are days when I feel depressed but I’m the type of person who has a natural positive and enthusiastic outlook on life. I just keep plugging along, working hard and knowing that I will find the right opportunity. It keeps me going knowing I will find the organization that will be the right fit for me and for whom I will be the right fit for them. 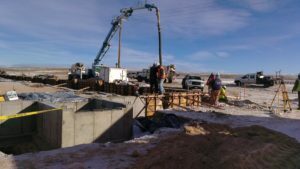 Working for an energy company based in Colorado and Wyoming, I pay very close attention to all the employment events that happen in the energy industry. Sadly, we are currently experiencing a serious downturn in the industry. Just recently, on 3.31.2016, two separate coal mines in Wyoming laid off a total of 465 people. Peabody Energy cut 235 employees at their flagship North Antelope Rochelle mine, the largest coal mine in the US, and Arch Coal cut 230 employees at their Black Thunder Mine. The reason behind the layoffs is due to three things. First, as in most mining operations, when the price of the commodity is high, operations ramp up and production is increased. This almost always leads to an over supply in the commodity which brings the price of the commodity down. Right now, there is an over supply of coal in the US. The nation’s coal fired power plants currently have approx 95 “days of burn” stockpiled which is the highest level since 2010. The power plants are saving their coal which is reducing demand and bringing down the price. Second, cheap natural gas is taking away from the demand for coal. The coal in Wyoming is competitive with natural gas when gas prices are $2.25 per million BTUs. Right now gas prices are below $2.oo and are expected to remain there through 2016. And finally, the unseasonably warm winter has made it difficult, dropping weekly shipments from western US mines to below 7 million tons compared to 10 million tons per week last year at the same time. 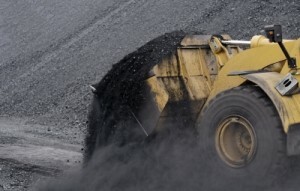 Year to date, US coal production is down 30 percent compared to last year. It all has to do with basic supply and demand economics. These recent announcements along with a series of other layoffs in Wyoming have impacted the local economy and will continue to do so in the foreseeable future. Colorado has also experienced a series of energy industry layoffs but they will be able to better absorb the impact since the Denver area economy is much more diverse that Wyoming’s. Wyoming, I fear will continue to suffer. During the summer of 2015, most of the counties in Wyoming had ridiculously low unemployment rates but now, only a few months later, the rates are significantly higher. Wyoming is the nation’s smallest population and a sizable percentage of that population is in the energy or energy related industry. There isn’t a lot of economic diversity in the state so when the boom is on, everything is wonderful. But when the bust is on, things get tough. Unfortunately, I am seeing the beginnings of another bust. Despite this dire economic news, I have to give strong kudos to Wyoming Governor, Matt Mead who quickly responded to the layoffs by deploying the Wyoming Business Council, the Wyoming Department of Insurance, the Wyoming Department of Workforce Services, and the Wyoming Community College Commission to help the people in the communities impacted by the layoffs. These state agencies immediately partnered together and set up temporary community resource centers for the people who were laid off. They quickly set up centers in Casper, Douglas, and Gillette and were opened from 10-7 on 4/1 through 4/4. These resource centers were staffed with experts who assisted people with unemployment insurance, job training opportunities, health insurance, and community health services. In addition, the Department of Workforce Services offices in the same three cities extended their hours to 8-7 on 4/1 through 4/4 where they were available to provide information on unemployment insurance enrollment, job training counseling, job search assistance, and resume preparation. I love the fact that Governor Mead quickly responded to the situation and did what he could to provide help to all the people who lost their jobs. I have found that Wyoming has an excellent organization in the Wyoming Workforce Services. I have worked with these people often and have found them to be very professional and helpful in all of their services. They are good people who have the best interests of the Wyoming workforce at the top of their priorities. It’s good to see a state government marshal it’s workforce services so quickly when there is a crisis. I applaud Governor Mead and all the good folks who work at the agencies for quickly stepping up and trying to help these people out. I fear many will move out of the state in search of other work but I hope many will be able to find work in Wyoming. It’s such a small state without the economic diversity of most other states. We’ll see how this all shakes out and I’ll keep you updated as things continue to develop. When Looking for a Job, Take a Chance! Today, I’m going to tell you a little story about my middle child and how she landed an amazing job in the tech industry before she graduated from college during her senior year. There was a lot of hard work on her part studying hard and building relationships with her professors and advisers but there was also some chance in the events that led to what she is doing now in her first career. At her university, like all universities, they have a series of job fairs for graduating seniors. She attended all the job fairs the university hosted and spent time preparing for each by looking over the list of companies and deciding which ones she was interested in talking to. I would chuckle when she would call me and ask me if I had heard about certain companies like Boeing and Burlington Northern. When she arrived at one particular job fair, she spotted a booth at the front of the room but didn’t recognize the company. It wasn’t on her list of companies she identified the night before but it was a pretty fancy booth so she decided to stop by and talk to the recruiter. She figured she would take the opportunity to just to get warmed up and get a little real life practice before she started to get serious about talking to the companies she was really interested in. My daughter ended up having a very good conversation with the recruiter and found out what the company did and that they were looking for some administrative positions in their corporate headquarters and trainers for their software implementations. But she left the booth without leaving the recruiter a resume! She figured she was just getting in some practice before starting to get serious with the companies she was targeting. Later that evening she received a call from the recruiter who she spoke to at that first booth. It turns out the recruiter was so impressed with my daughter during their conversation that she wanted to talk to her some more. But she quickly realized that my daughter had left without leaving a resume so she started asking people in nearby booths who she was. Fortunately, my daughter’s adviser was nearby and had seen the two talking and was able to give the recruiter her name and phone number. She also had nothing but positive things to say about her. The recruiter called my daughter that evening and scheduled a formal interview with her for the next day. She apparently nailed the interview because the company flew her to their corporate office in Denver for a series of interviews. There, two departments in the company interviewed her since she had expressed interest in both departments. Ultimately, both departments wanted to hire her. She found that out when the head of one of the departments actually called her at her hotel room and asked to take her to coffee that evening to talk to her again. That department head told her this has never happened before – two departments vying for one candidate. They had a nice conversation and the department head said that she would probably lose out to the other because that other department was more important and influential in the company. Well, shortly after, she got a job offer from the more important and influential department. The offer was extremely generous and I strongly recommended that she should absolutely accept. She accepted the job and has now been working there for almost a year now. She loves her work and is thankful that she decided to stop by at that first booth to practice before getting serious! 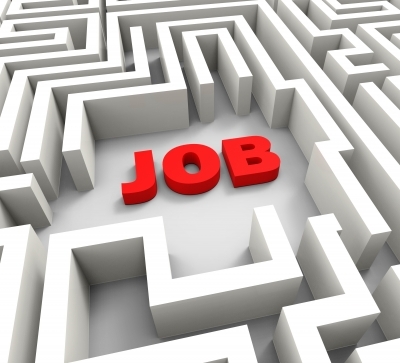 There are four clear takeaways from this story when you are out there job hunting. First, explore all opportunities that are available. You may not have ever heard of a particular company, but don’t let that stop you from interviewing with them. There are more B2B and B2G companies out there that very few people have heard of but are just as prestigious to work for as any B2C company. Second, relax and be yourself when you are interviewing. My daughter wasn’t really trying hard to impress the recruiter in that first booth. She was just there to warm up and practice and because of that she was behaving more naturally and like herself. This obviously made a strong impression on the recruiter. Enough so that she made the extra effort to find out who my daughter was and contact her for a formal interview. Third, always leave your resume with every recruiter you talk to! Most recruiters won’t take the time to figure out who you are if you didn’t. They talk to a lot of people at a job fair. And finally, my daughter is awesome and I’m very proud of how hard she worked through college and her ability to start her career at a job she really loves. In a recent article over at SHRM, they discussed the bias against women and men (but mostly women) trying to re-enter the workforce after taking time off from their careers to stay home and raise their kids. Most hiring managers and HR tend to think these women have lost their edge in their industry and are, therefore, not strong candidates. They are passed over during the hiring process for candidates who have not taken the time off to raise their kids. I think this bias is wrong and have first hand experience that supports my belief. I’m pleased that the article is supportive of these women and discuses the positive attributes and skills that stay-at-home parents acquire during their time raising their kids. …some HR experts argue that stay-at-home parenting actually imparts skills that prove valuable in the workplace, such as patience, persistence, creativity and reliability. “Careers for men and women, parents or not, are no longer linear, and an accomplished woman who took a career detour to devote herself to motherhood can still be an incredibly valuable hire,” said Marisa Thalberg, founder of executivemoms.com, a networking site for working mothers. “When parenting, you are often forced to negotiate with someone who may not be reasonable, and that’s a good skill when dealing with unreasonable clients and others,” he said. In my time as a store manager at Macys, I hired many women who had taken several years off to raise their kids. The article does claim the retail industry is easier to assimilate than industries such as law, medicine, and IT. I can easily say almost all of the return-to-work moms turned out to be fantastic hires and very valuable employees. Many of them ended up being managers for me who have since gone on to very successful careers. One in particular, is a regional director for a large specialty retail chain store who has thanked me many times for giving her a chance when she was re-entering the workforce. Several others are now business owners or are in mid to high level management positions within their organizations. I completely agree with the experts quoted above who emphasize the positive attributes gained by those who raise their kids. In addition to what they say, stay-at-home parents learn how to juggle multiple priorities while being constantly distracted. They have strong interpersonal skills in being able to negotiate and deal with difficult people. They have learned how to manage difficult situations while instilling a sense of fair play. They have learned how to motivate people to be their best. And having and raising kids matures and humbles people. These are all attributes and skills that are valuable in any workplace! I want to include my wife who recently re-entered the workforce, in retail, after many years of staying home and raising our kids. Its interesting to note that there were significant changes in technology that she had to deal with and learn but the core basics of retail are still the same. It took her a little time to catch on the the technology changes but she did. Along with her outstanding leadership ability, her selling skills, great customer service, and credit production, she is now a very valuable and highly desirable employee. Her boss has tried to promote her several times but she isn’t quite ready to take that step yet but I know she eventually will and will be very successful. Bottom line, hiring people who took time off to raise their kids is not as risky as most people think. Any parent who has raised or is raising their kids should know how difficult the job is and the skills that are developed while doing so. Sure, there will be a learning curve at first but there is with all new hires. The bias against people who are trying to re-enter the workforce after raising their kids should end. Employers are missing out on very skilled, motivated, and dedicated employees by passing them over. Last week, on Monday, January 5, 2015 I logged into the SHRM Certification website to take the Online Tutorial Pathway that would earn me the SHRM-SCP certification. The first thing I had to do was create an account to the SHRM Certification Portal. This is different than the SHRM membership so new login credentials must be established for the certification site. As I created my account and registered, I noticed the website was very slow – probably due to the heavy traffic on the first day the Online Tutorial Pathway was available. Shortly after registering, I received an email notifying me that my profile had been successfully set up. Accessing the Tutorial: The tutorial can be accessed online via the URL below. Please note that you will have 10 days to complete the tutorial, with the ability to save your progress. The tutorial requires a current version of Adobe Flash to run. If you are having issues launching the tutorial we recommend accessing the course in Chrome. What is the tutorial? : The SHRM Certification Online Tutorial Pathway is an educational program, and not a text/exam. Activities found in the tutorial will not be assessed or assigned a score. Duration: The tutorial will take approximately one hour to complete. Completing the Tutorial: Upon completion of the tutorial, you will receive a confirmation email with information regarding next steps. Existing Credentials: You do not have to give up any existing HR Generalist credentials by participating in the SHRM Certification Online Tutorial Pathway. The next morning, before going to work, I clicked on the provided link and proceeded with the Tutorial which took approx one hour to complete. It was exactly as SHRM said above, an educational process explaining the reasons SHRM is launching their own certification and an overview of the eight behavioral competencies of the SHRM Competency Model and the SHRM Body of Competency and Knowledge. After the explanation, they had me take a survey answering questions about my knowledge and experience in each of the eight behavioral competencies. From this they generated my Competency Self Portrait. 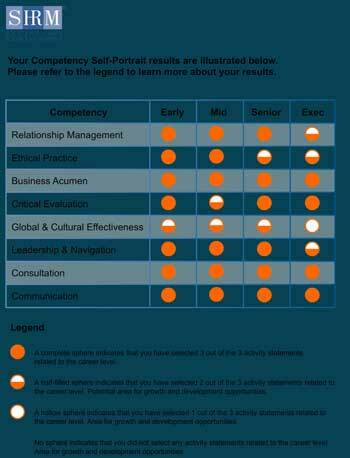 The Self Portrait measures your career experience – Early, Mid, Senior, and Exec – in each of the eight behavioral competencies. A completely filled in sphere means you selected three out of three of the activity statements for that level of experience, a half filled sphere means you selected two out of three, an empty sphere means you selected one out of three, and no sphere means you didn’t select any of the three statements. 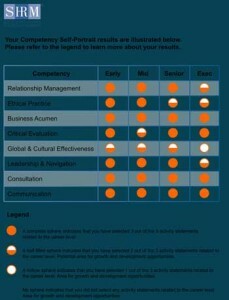 As can be seen on my Self Portrait, my weakest category is in Global & Cultural Effectiveness. This is not a surprise since I don’t have any global or international HR experience. My strongest categories are in Business Acumen, Consultation and Communication. Again, this is not a surprise since I have a great deal of experience in these three categories. I really like the Self Portrait as it shows me the areas where I need to continue to develop. The next stage of the Online Tutorial was taking a sample exam by answering several questions similar to what is on the actual exam. SHRM wants to give those of us taking the Online Tutorial Pathway a taste of what their exam is like. The questions are from “real life” situations describing a scenario with three questions for each scenario looking for the appropriate HR solution. There are four multiple choice answers to choose from for each question with a best answer, a second best answer, and two answers that are wrong. It’s interesting that they have a second best answer but, of course, the best answer is the correct answer for the purpose of the test. I’m assuming the regular exam is set up in this fashion. After taking the sample exam, I finished up the Tutorial and was notified by email that I completed it and would be notified within 72 hours that my certification was granted. It took about four hours to receive the email notifying me that SHRM had granted me my SHRM-SCP. Initially, I was pleased but it didn’t seem as important to me as when I earned my SPHR and, more recently, my SPHR-CA. I had to study my brains out for those and the feeling accomplishment of passing those exams was significant. However, I did appreciate that SHRM recognizes the HRCI certifications and is offering their certifications to those who have them. Now that a week has gone by and I’ve had some time to let it sink in, I have really come to appreciate my SHRM-SCP certification and am impressed with how SHRM developed the SHRM Competency Model and the SHRM Body of Competency and Knowledge. I am also impressed with their Online Tutorial Pathway. Except for the slow website which was to be expected on the first day, everything went very smooth and was very professional. I think SHRM has done an outstanding job with their roll-out of their certifications and I’m proud to now hold the SHRM-SCP certification. During the month of November and December, I was studying very hard for the SPHR-CA certification and was unable to devote the time I wanted here at HHHR. In fact, I was surprised when I looked back and saw that I only posted a couple blog posts and released only one podcast! Instead, I devoted the majority of my free time in the early mornings and after work to studying for the certification exam. So, why in the world would I, an HR pro living and working in Colorado and Wyoming, decide to take the California SPHR certification? My company has no employees in California and I don’t see any chance that we ever will. Why “waste” my time?? I have two reasons why I sat for the SPHR-CA certification. First, I am a strong proponent of certifications, whether it is through HRCI or SHRM. To quote HRCI, certifications “demonstrate relevance, competence, experience, credibility and dedication to human resources to your employers, clients, staff members and professional peers”. I want to earn all the certifications I am eligible for. I’m elegible for the SPHR-CA, so I decided to take it. I would take the GPHR (Global Professional in Human Resources) if I could but I have no international experience, making me not eligible, unfortunately. I will also take the necessary steps in January to earn my SHRM-SCP. Second, the CA certification gives me one more HR specific credential that I can leverage in the job market. I believe each person is responsible for their careers. You never know when you will be suddenly out of a job or a job opportunity of a lifetime presents itself. You are responsible to be ready for these events. In fact, what initially got me thinking about the California certification was two amazing HR executive opportunities that were presented to me through recruiters in 2013 and 2014. Interestingly, both opportunities were based in Denver but had the majority of their employees working in California. I explored both opportunities but, in the end, lacked the necessary California HR knowledge. I love my current job, but as I’ve said before, I will always seriously consider and explore any great executive HR job opportunity. So, with my decision made to take the exam, I purchased the study guide from SHRM this past summer and started studying. I really hunkered down in November and December and sat for the test on the morning of December 15. The test was just as difficult (maybe even more so since I have no CA HR experience) than the SPHR test. It consisted of 125 questions and has a time limit of two hours and fifteen minutes. I memorized the definitions in the back of the SHRM study guide and I took and retook the quizzes at the back of each study section. At the first of December, I put the book away and focused just on taking practice tests. I took the practice test offered by HRCI and I found a great resource at HRCalifornia. HRCalifornia has a great practice test and a fantastic and informative website. I took advantage of their 15 day free trial and spent a great deal of time there learning things that were not covered by the SHRM study guide. Those of you who have taken an HRCI test, know that feeling of relief when the screen pops up telling you you passed at the end of the 2 1/2 hours! What a great feeling! As with the SPHR exam, the California exam was so difficult, I thought I was surely flunking it as I was going along. But its important to trust yourself and your preparation and be confident throughout. So now I proudly hold the SPHR-CA certification. There are only approximately 500 people in the US who do. I don’t know if I will ever need it but but now I have it in case I do. It gives me one more credential and expands my career opportunities should I ever need to look for another job or should a great executive HR job come my way again. I highly recommend that you take the California certification for those who hold a PHR or an SPHR.